I have a small problem with impulse purchases when inside the walls of a Walgreens or Target. Thankfully, these small purchases don't break the bank. On a recent shopping trip for I-can't-even-remember-what, I picked up this new Garnier Fructis product. 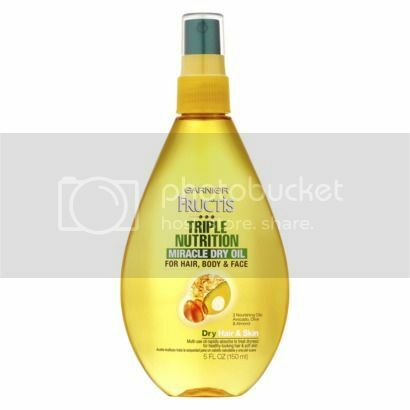 It's called Triple Nutrition Miracle Dry Oil. The bottle says it's for the hair, body and face. It contains avocado, almond and olive oils. Since I've been battling super dry skin this winter, I thought I would try this in addition to lotion. You spray the oil 6-8 inches away from your skin and massage it in with your fingertips. It does feel greasy at first, but only until you rub it in. My skin feels incredible after. Soft. Silky smooth. Like buttah. Not dry! And on top of it actually working, it's cheap. As for using it on my hair, it didn't have the same results. I looked like a grease monkey immediately after using it. I may be in the minority though. Most hair products make my hair oily. 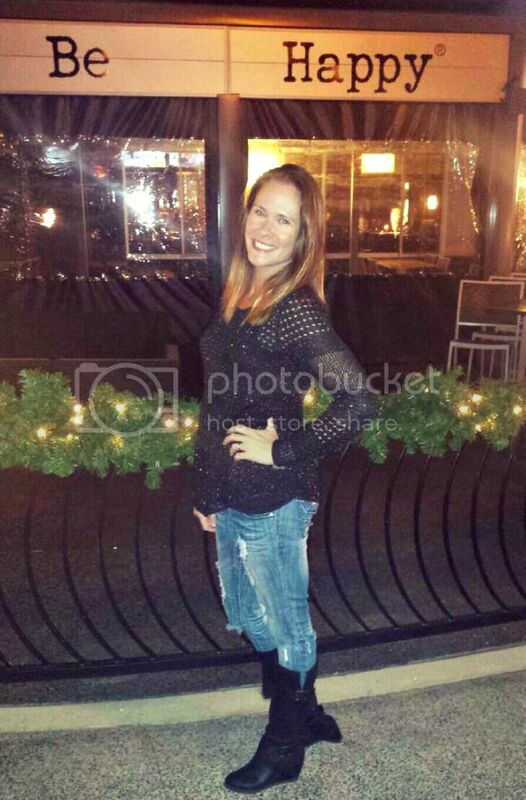 I use and love another Garnier Fructis product on my hair. 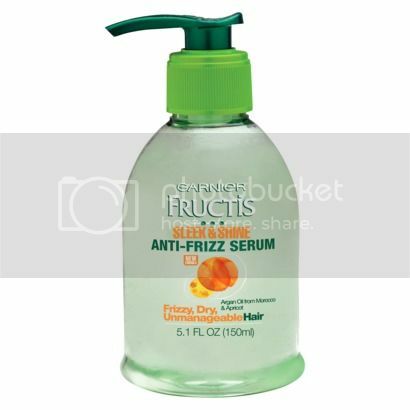 The Sleek & Shine Anti-Frizz Serum doesn't make my hair oily if I don't overdo it. I have annoying flyaway hairs around my face. My stylist likes to call them baby hairs because they are baby fine and don't grow. I use a half pump of this after I've dried and straightened my hair. I rub it into my palms and then lightly run my hands through my hair. It works and smells delicious. Let's talk about my face for a minute. As a teen, I got the occasional bad breakout. Now, I only get a pimple or two when my monthly visitor arrives. If there's one thing I'm enjoying about my thirties, it's that my skin is in great shape. I can leave the house without wearing foundation and not have a care in the world. I don't have an uneven skin tone. I don't have any redness or sun spots. I consider myself to be very lucky. But there is one thing I never leave the house without, and that is concealer. I have the darkest under eye circles. It doesn't matter how much sleep I get or how much water I drink. I don't have any problems with puffiness, only darkness. So I am always on the hunt for a great concealer. I recently ran out of a few of my favorites. 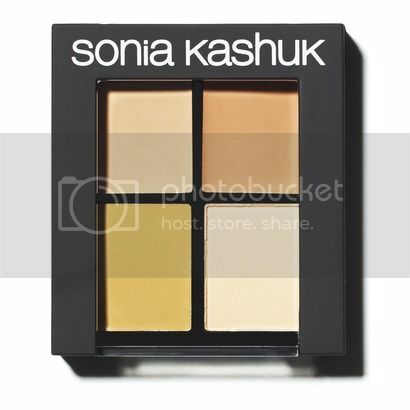 While perusing the beauty section at Target, I ran across several cheapie concealers from Sonia Kashuk. This one is called the Hidden Agenda Concealer Palette. I'm always blending concealers to get the perfect combo. Since this one came with several shade options in one, I thought I'd give it a try. Plus, it was only $10. The palette comes with two colors for blending and a third neutralizing color for covering redness and imperfections. The fourth is a finishing powder. I've only been using this for a few days, but I'm extremely pleased with the results. I love that I can leave the house in the morning without looking like a zombie and without breaking the bank. What inexpensive beauty products do you love? I had the same results when putting the oil on my hair! Very greasy looking immediately after drying. gross! I've been wanting to try the oil spray! I'm all about multi purpose products! Concealer has also become my friend lately. I really like the elf conceal and highlight duo. WAY cheaper than the YSL I'm always craving and it makes me look like I slept. Oh I definitely need to try the oil on my skin! It's so dry from this weather! I have been curious about that spray - sounds awesome for the body. As far as for the hair - I might try it at night - when I wrap my hair up on top of my head (to conserve a blow out). Maybe just on the ends where I need it most. I love how great Garnier stuff smells - I will have to try this serum. I am a huge Frizz Ease hoarder, but I'd like to try something new for a bit. OOOH girlll I have the same issue with my eyes... no puff, no bags but lots of darkness. This sounds like it might be worth a shot for me. I currently use 3 different products on my face, conceal, highlight and cover... all do an OK job I'm trying to find my perfect match and it's been hard. Especially when my under eye area is so dry. *** I just purchased the Maybeline FIT ME concealer and it's OK - not in love with it. I am currently in a monogamous relationship with the Neutrogena (sp?) Face Wipes. Blue packaging - I've tried the others and always go back. They get off ALL my make-up with a few swipes my eyes are clean (maybe a bit of mascara left over but I usually splash my face even though you don't have to and I'm done - put on some face lotion and eye cream and off to bed I go. I hate washing my face at night - when I'm fully dressed because I MAKE A MESS! Saves my skin and from me having to scrub in the AM in the shower. I'm gonna pick up the Garnier oil for my skin. I'd have the same greasy problem with my hair. Does it smell good? I have one from Julep that I love, but it's too expensive to keep buying. I also have baby hairs and mine are curly so it's even worse! I'm also going to get the concealer. I'm always looking for one! I have the worst dark circles. My favorite drug store products lately are Not Your Mother's dry shampoo and Baby Lips Dr Rescue. I am a little jealous of your great skin. I have redness and have to cover it before I leave the house! Lucky! Sleek & Shine serum has been my go to the last few months, but I have a feeling it won't totally stand up to the SC humidity this summer. May have to try the first.